OILERS Day 4 'Development Camp"
Lots of Buzz today around Justin Schultz but people still paying close attention to every move that Nail Yakupov makes. Players like Oscar Klefbom very noticeable today as well as the 'Twin Towers of Slovakia' , Martin Marincin and Martin Gernat. Marincin looked very good out there today in scrimmage in last 30 minutes of practice today. Curtis Hamilton showed like he had more drive out there today stepping up his intensity more then previous days. Samu 'the Goalie' showed some nice displays while flashing the leather in the scrimmage time. Got some inside information today that I am tracking down but not certain on in regards to some trade talks. All I can really say, is where there is smoke their is usually fire. Highly likely if Oilers can trade for a player they are looking at, it will cost prospects in the system but not sure who that would be with any certainty. Not to mention, to say a specific name could just lead to rumours galore. In the end, should Oilers get trade they want, 1 or 2 decent prospects will be going the other way. Should a trade happen let's hope only prospects that are not of the high end calibre. #zharkov‬ stays out to get some dekes on ‪#Roy‬ . Scores a‪#Beautyfake‬ as advertised in interviews haha!! The Edmonton Oilers... Destination #1? Schultz Says So! The past is the past for the Oilers now. 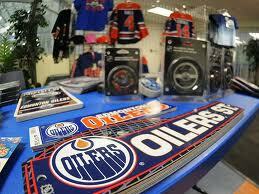 Long gone are the days of not wanting to be in Edmonton to play hockey with the Oil. The advantages of coming here are at a high. Taylor Hall, Jordan Eberle, Ryan Nugent-Hopkins, Magnus Paajarvi, Nail Yakupov, Anton Lander, Teemu Hartikainen, Jeff Petry, Oscar Klefbom, Martin Marincin, Devan Dubnyk, Tyler Bunz. Now the Oilers have free agent Justin Schultz to add to the list. I'd hope and expect the Oilers to land a few more good players to compliment the kids listed above. With all this youth and excitement, I have no doubt the Oilers will be Stanley Cup challengers sooner, rather than later. Our door is open in Oil Country... we welcome those who want to join the fun. Day 2 of on ice sessions at Millennium Place begun Thursday AM, and Nail continued to deliver on his promise of delivering to fans. He does continue to be the buzz and talk of all the 200 plus fans taking time to see the Oilers prospects on this Thursday morning. unfortunately Day 3 on ice , I am unable to attend LIVE and will have to wait for Day 4 on Saturday morning to see the next action in person. Basically it is Nail Yakupov, and the BIG Defence that is the talk of this camp. Here is a bunch of the tweets that I posted from Day 2 at camp, if you were unable to attend yourself. Cheers folks and will be TWEETING "LIVE" again on Saturday morning. #zharkov‬ is listed as 211 in ‪#Oilers‬ camp program. Has lots of room to still fill out. ‪#musil‬ comes in this year at 198lbs. #oilersdevelopmentcamp‬ some kid named ‪#brandonmagee‬ has a hell of a shot. Wow! #oilersdevelopmentcamp‬ 3forwards on 2 d-men breakout drill.‪#klefbom‬ cuts off forward and almost crushs him. Day 1 at Oilers Development Camp passed and the players began another step in their hopeful new career into the future. The crowd was buzzing with excitement about some new players at camp like Zharkov, Klefbom and of course Yakupov. As with Hall in his camp year, Yakupov is a fast and fierce player but his kind of skill is not going to be displayed in these drills and exercises. 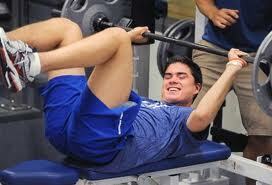 As the week goes on we will see how well Yakupov gets with the practices. He performed well, but the buzz and talk among the crowd was far more enjoyable. Nail has definitely brought a excitement to Oil Country but not only because of his skills but because of his personality. The crowd was laughing, pumped with excitement of the potential of a 'fab four'. There were a couple highlights today that stood out to me while I observed the agility skills and exercise routines. Tobias Rieder, Oscar Kelfbom, Taylor Fedun, Dillion Simpson, Daniel Zharkov, Martin Gernat and Martin Marinicin all were players I followed more closely today. For those of you following me on twitter, you already followed some of my comments during yesterdays camp. Tobias Rieder ; Very smooth, has really picked up in his agility and can shoot the puck like it's nobodies business. Hisaccuracy looks to have improved substantial this past year. Taylor Fedun ; His leg no longer looks to be a concern and hopefully it is a sign of good things to come for this young man. His skating was looking sharp and his puck skills and shot is as accurate as it was before his injury. Dillion Simpson ; Dillion looks two steps faster this year. Watching him move out there, you would think that he was two years more advanced in his training. Will be interesting to see how he fares going forward. Daniel Zharkov ; Interesting player , can definitely see that size, but even at around 200 lbs he looks like a string bean. His passing skills looked somewhat poor but maybe it's just rust from time off. On the other hand, good passers don't lose their touch that much. Players can always improve but not sure he has that ability naturally. Martin Gernat ; Impresses me everytime I see him play. 10 pounds heavier this year coming in and looks more solid. Now at 6'5 and 200 pounds pretty much, Gernat has some great offensive flare. Martin Marincin ; Marincin once thought to be a offensive dynamo, looks more and more like a well rounded D-men then ever. Does not do anything that stands out specifically during his drills, but looks quite relaxed and still has that great outlet pass up the ice. While Nail Yakupov is the show, there are several defencemen that have some great possibilities of showing well in the future. Heading back over to the ice to catch more action this AM. If your interested in any LIVE information this morning from Oilers Development Camp 2012 give me a follow on twitter , as I will be tweeting LIVE from Millennium Place in Sherwood Park. The beginning of the NAIL! Today opens up to the public of Edmonton to get another look at the Oilers prospects, both young and old. 2 years ago, the public swarmed into Clareview arena to get a first hand look at Paarjarvi, Hall and Eberle. Last year, their was several people at Millennium Place but the excitement to see Ryan Nugent-Hopkins and Lander on the ice, was not the same. 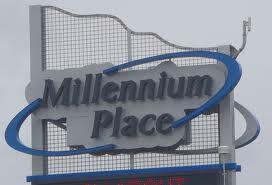 This year, I suspect with Nail Yakupov and Oscar Klefbom in town, Millennium Place will be packed tight with on-lookers. The most difficult thing for fans to do is not try to evaluate the skills sets they see out there on the ice. It truly is about staff seeing these kids develop and will not be assessing or evaluating where they are at. On the other hand, should you look out of place and be further behind in your development? It means your progress has slowed down, therefore it really is about evaluating. For the guys who have been at a camp or two, it means checking in on how their development has come along. For the new guys, it is about assessing and putting together a plan for them to development more this summer and into and through next season. It also goes a long way to make decisions where players could be placed this next season. With fitness testing done, Nail Yakupov and his teammates will take to the ice today but he may be in for a bit of a surprise. Day 1 of camp can be a disappointment for fans as well. Day 1, is about executing various drills and learning new skating skills. Nail would love to show off for his fans, but is it possible in a development day like Day 1? Only time will tell. Klefbom will be getting his first chance at doning some Oiler silks on the ice today but I am sure the crowd will be buzzing about his future potential. With only one more day til the Oilers Prospects take back to the ice at Millennium Place in Sherwood Park, it was important to finish off the forwards who I did not cover in yesterday's blog. It's always interesting to see what a player looked like a year previous and to see if they were able to improve on where they were at the previous year. Let's just say, I have not yet seen a prospect in the Oilers system not improve the following year and go on to become a NHL player. Granted with only 4 years going, that may not be enough time to really evaluate. 1st Viewing: That being said he was good positionally and has a great shot. 2nd Viewing: very quick learner, good skater, good passing and stick handling abilities. Looks like a quality player that is well rounded in his skills. Notes: has 2 years in AJHL , 2 years in BCHL and 4 years NCAA. His age and experience shows at camp. One of the best players agility, positioning and skill wise but is 7 years older then this year’s draft picks. Will be in tough to make the grade to NHL but does have the tools. This year and next will be his prime opportunity. Could possibly be a 4th line centerman call up this year depending on injury call up and how well he continues to grow in the AHL. All arrows are pointing up at this time. in 2010 NHL Entry Draft. 1st Viewing: Flashes of skills but a definite project. Lander and him collided at center during one drill but Im pretty sure Lander saw it coming and still hit him (he let up though). Maybe hinting at him without using words to keep his head up cause as a smaller player he will get demolished with his head down in center ice like that. To me he is no where near the skill level of Rajala though, so if Rajala has no chance on this team then he doesnt either unless he improves dramatically. Notes: Most likely back to the Rangers next year. Very speedy player. Smaller size will make it tough to crack our squad at any level but his compete is good. Good agility and looks to be a quick learner. Should he continue to progress this year and plays in the OHL he could push a way into a better place. Should he not improve on his stats in the OHL, he could be flushed out. 1st Viewing: I really like him. Seen him a million times on the Oil Kings. With each viewing he seems to have more confidence and therefore his game is more consistent. He is really fast and has a great set of hands. Likes to buzz around the net. 2nd Viewing: all over the ice and finishes plays well. defends his area good, executes excellent. Really progressed since last year. Notes: Has 1 year BLR Jr league and 1 year WHL. He was flying all camp. Very impressive. Was in on the action several times. Agility very good, and his speed is astounding (or at least looks like it on the ice). His playmaking skill is very good and looked great during 3on3 tourney. Has improved lots this last year even evident during the last half of his WHL year. Edmonton’s 2nd choice (2nd round), 40th overall, in 2009 NHL Entry Draft. 1st Viewing: Doesn't stick out because he is not flashy. The definition of a leader though. Constantly helping others understand the drills, leading some of them, giving tips (as stated in Bruce McCurdys live blog) and has a great shot. Notes: Has 4 years playing in SEL. Has improved in every aspect each year and arrows are pointing upward still. 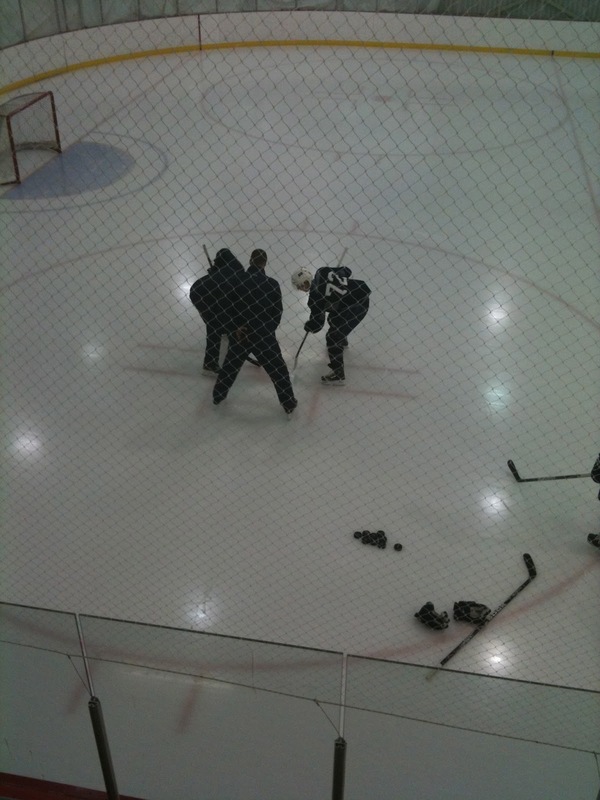 First step is much quicker (noted by coach's and other oilers brass) great in the face-off circle. Played tough minutes in SEL with men for awhile makes him so much more ready. Could tell this development camp he has improved and become more seasoned and poised even with the puck in scrimmages. Very much shows leadership out there on the ice with younger guys, communicates and talks with guys after the plays and can tell he is always thinking the game. Love his execution of drills and how easy it is looking for him in compared to last years development camp. 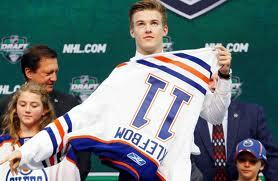 Will have a honest shot at a centerman position in training camp with the Oilers but most likely will be assigned to OKC to develop and learn the North American game and be the first center called up due to injury or trade. 1st Viewing: Slow skating with an amazing shot. Beat Bunz skating down his off wing far post. Dont see goals from that angle often. Notes: Spent 5 years in the OHL and 4 years just completed in the CIS. Unfortunately being older like Tanner House makes it more difficult to make the next jump, but if development camp is only the beginning he will be competing hard for a job. To me is a perfect 3rd or 4th line winger type like Ryan Jones, but will probably have the chance to show what he has in OKC this year. One tough hombre who competes every shift. And this development camp showed he has a great shot too. 1st Viewing: Was off previous two days recovering from swollen ankle. Showed real well today. Hard on puck. Not as impressive as I think he should have been on agility drills but he fared well. His strength is his shot. Probably the hardest and most accurate shot at camp. Displays good puck skills and shot during some scrimmaging. Can see his power forward ability as he doesnt shy off his guy very much. Uses his body well to keep puck away from attacker. happens.movements lateral were excellent, so looks like ankle is handling well. Lets hope the ankle holds out tonight and can play tomorrow. Notes: completed 1 year HIGH SCHOOL , 1 year in NCAA hockey and 1 year in the WHL. A incredible tough player to get off the puck. Very confident (some could say cocky) but has ability and mad skills to back it up. Hardest and most accurate shot at this camp. Can definitely be a pure goal scorer. Likes both center and wing , just wants to play. Unfortunately did not play in 3on3 scrimmage as injury started acting up. Sad though, wanted to see how he fared. Was limping off in regular cloths on ice at end of the camp. Sad to see, re-occuring problems recovering from injury not good. Probably over worked the day before, even though he said he felt good. Was tweeting with buddy Bunz how he was going to light him up last evening, so obviously was unexpected the problem today. Excellent execution on the ice, not afraid of traffic. Wants to play in AHL and most likely will get opportunity on 1st or 2nd line in OKC next year. Hopefully he recovers soon and is able to train for his off season work outs ok.
1st Viewing: Seems to have grown a lot since the end of the Oil Kings season. Great two way player who keeps it simple. Him and Lander seem the same to me in the defense side of the category, where Lander brings more offense to the table and Ewanyk brings more Jam. 2nd Viewing: steady player, relaiable, nothing noticed good or bad. 1st Viewing: My second favorite forward today. The guy is physically imposing, amazing shot, great skater and great along the boards. I think we got a steal in the second round ladies and gents. 2nd Viewing: was non-existant for me today. Never stood out good or bad, but had hard time finding him on the ice. Going to try tomorrow to focus in a little more on him. 3rd Viewing: Finally saw some action with him today. Good skater (as mentioned in earlier tidbits , showed well in leg strength and agility)very composed on the ice and well aware of movement around him. Good one timer in his shot. Needs a harder shot but saw a couple good one timers off of some passes. Alot like Teemu Hartikainen style, but hard to tell as checker due to development camp just teaching not exhibiting. 4th Viewing: couple really nice plays on 3on2's attacking and can tell he will be a tough one to stop as he will not shy from going hard to the net.had one laser of a shot top shelf. Notes: Has played 4 years in the WHL. Definately has good agility for a man his size. IMO I think he needs to work some on that initial acceleration as a skater. His skills , his vision looks good and seems to get along with many players both young, older and even those who speak little English. Always laughing and rubbing shoulders with guys out there on the ice. His time in the WHL is over, so this will be his year at the AHL level to compete with men. After working his way up the line up at the world jr’s this year it will be interesting to see where his top game is. Most likely will be a player in Hartikainen’s mold so probably a 4th, top 3rd line player at this time in his career. 1st Viewing: Sublime. He impressed me more then any rookie at any rookie camp so far (Ive gone the last 4 years). Speedy, shifty, amazing hands, underrated shot. He scored top shelf three consecutive times in a drill on Roy and Tuohimaa, two shot where the goalie didnt even go down or move cause he got it off so quickly. Between his passing and shooting today and his shiftiness I will be shocked if he isnt an Oiler in game 10 this year. He is shifty, and the Oilers Mike Sillenger mentioned on oilers lunch today they like that he is maticulous with his learning and perfecting drills. enough said..
5th Viewing: RNH is a different story. He shows the talent and skill that both Paarjarvi and Eberle did at last years camp. (except Paarjarvi was 1 year older and Eberle was two years older) I saw Eberle his first camp and was even interviewed by CBC sports radio. I stated then, that he looked good but was pretty certain he would be back in jr. So having said all that...am I on the RNH kool-aid? Yeah I am loving what i saw from RNH after he returned from his failed attempt to make the canadian jr team. I have seen him live and watched about 6 games on television. He is a learner, student of the game like Hall, but he has this doggone attitude that is unlike anyone i have seen to date. IMO ...be it this year or in two, RNH will be our top point getter, believe the hype boys, believe the hype! ok...I know some of you may believe that is a bold statement, but RNH will make you stand in your seat in anticipation of a possible scoring opportunity anytime he has the puck. Notes: Played 2 years WHL, was rookie of the year in rookie season, then steped it up last year. Always excelled and competed well when moving up a level in hockey. Not much needs said, has incredible agility, is meticulous with all instruction given to him. Has the agility of a cat, keeps his head up at all times, unreal vision on the ice, uncanny ability to get passes through sticks and people to his open man who has a open net in most cases. Not very talkative on the ice and sometimes looks like no one else is out there but not always a bad thing. Very focused. Looks young, but is a hard worker. Should be a interesting Main Training camp in regards to how well he can do with men who are veterans of the game. in 2009 NHL Entry Draft. 1st Viewing: If he can be a fighter at the NHL level I see him being a Eager type, functional fighter. Notes: Has played 4 years in WHL. Had not a bad camp at all. Looked slower at beginning but by the end of the week on RNH’s team sat for scrimmage he could move the puck and protect it well. Believe he will not be able to play in WHL next year so most likely will be moved up in the system now. Critical year to show his tough guy and good player ability. "NAILING it on Draft Day"
The New Edmonton Oilers App! Edmonton Oilers Preseason Schedule Is Out!